Using the ‘myth’ of the now-torn down Dreamland Theatre as inspiration, DREAM.big captures the inspirations that created Edmonton, and the hopes of the newly revitalized East Downtown area. 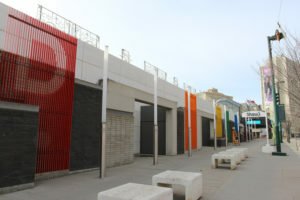 The importance of the site’s location and its viewpoint from Jasper Avenue looking down 97 street – one of modern and historic Edmonton’s major axes – demanded a strong concept and large scale. DREAM.big consists of six decorative screens spelling out the word ‘DREAM’ in giant letters. The screens do not obscure the building’s face – as one walks past the screen, the ‘DREAM’ appears, then disappears, only to reappear again as one goes past. The colours, symbolizing the colours of ammonite – Alberta’s provincial gemstone, also ‘shift’ as one walks past. 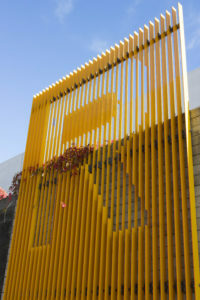 The lattice work of screens creates interesting shadows on the walkway in front of the building, and also allow the surrounding vines to wind their way up and through.